The fore-cast one minute before the game was for 80% chance of rain by 6pm. That turned into 100% by a bit before 1pm. It was a wet game. But it felt a lot better than baking for over 4 hours in the bright Sun!! 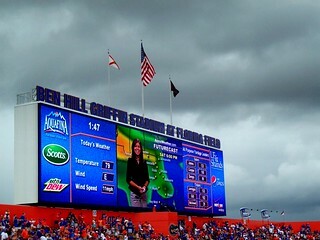 This is the new Daktronics HD-X LED video board in Ben Hill Griffin Stadium. The larger south end zone video display measures approximately 136 feet wide by 30 feet high. The video board can operate as single giant displays or be divided into multiple zones (windows) to show a wide variety of statistics, information, graphics, animations, and live and recorded video. Wow, this is huge! Great contrast of that bright shining board against the dark sky! That is pretty neat. What a monster!! Thanks for showing this. You are the Gator Queen!! Rain heat or hail, your there for your team 🙂 Nice photo, Marijka!! Gator Queen! Gator Queen! Gator Queen! Gator Queen! Hi, I’m an admin for a group called Eastern USA Photobugs, and we’d love to have this added to the group! Great new sign that can be seen for a long ways!!! This mega screen cost almost a half-million dollars. You have to wonder if some of the job lay-offs at the university could have been prevented if the money had been directed at saving those jobs. The colors show up really well! Thank you for sharing your great photo with us! Beautiful capture photographed beautifully ! I’d never gone to a game in rain like that before… My clothes were dripping for hours afterward! This is a beautiful new colorful board and I love that sky too!!! Thanks for the visit on the other site, Marijka.